The release of the TPP text on November 5, 2015 has caused many friends in Chinese IP colleagues to wonder what implications, if any, there are for China’s development of its IP system. China’s recent experience of bilateral investment or free trade agreements has not prepared it for a major regional IP-related agreement such as the TPP. China’s FTA experience has thus far focused on a limited range of issues, most of which are not “core” IP. As one academic researcher noted “the majority of China’s RTAs [Regional Trade Agreements] focus… on specific categories of IPRs, namely GIs and genetic resources and traditional knowledge or border measures, often omitting any reference to other categories, i.e. copyright, patents, trademarks or IPRs enforcement.” The last comprehensive IP agreement that China entered into was its accession to the WTO with adherence to the TRIPS Agreement (2001). The TPP is however more comprehensive and forward looking than TRIPS. The China-Swiss FTA (2013) calls for some important, but limited improvements in China’s IP regime, particularly in areas involving designs, customs protection and plant variety protection. To take plant varieties as one limited example, the TPP requires all member countries to sign on to UPOV ’91. This was a step that Switzerland, a member of UPOV ’91 since 2008, did not secure in its bilateral FTA with China despite Switzerland’s having a flourishing agroscience sector. By any measure the demands that would be placed on China by acceding to the TPP would be greater than most of the developed world, particularly for countries like Singapore, Chile, and Australia that have concluded free trade agreements with significant IP chapters with the United States in the past several years. TPP allows the U.S., Japan and our partners, to offer a high-standard, rules-based alternative to China’s state capitalism. China has already acceded to all the major treaties enumerated as required for TPP accession with the exception of UPOV ’91 — namely the Madrid Protocol, Budapest Treaty, Singapore Treaty, WCT. WPPT, as well as the Patent Cooperation Treaty, Paris and Berne Conventions, and of course the TRIPS Agreement. I believe that most of the challenges to China are likely not in the form of adherence to required treaties, but in the more granular implementation of those treaties and in commitments that are not found in any current treaty that China is a part. For example, in the pharma sector, the TPP contains extensive provisions on patent linkage, patent term restoration, and data exclusivity which go beyond the TRIPS Agreement. 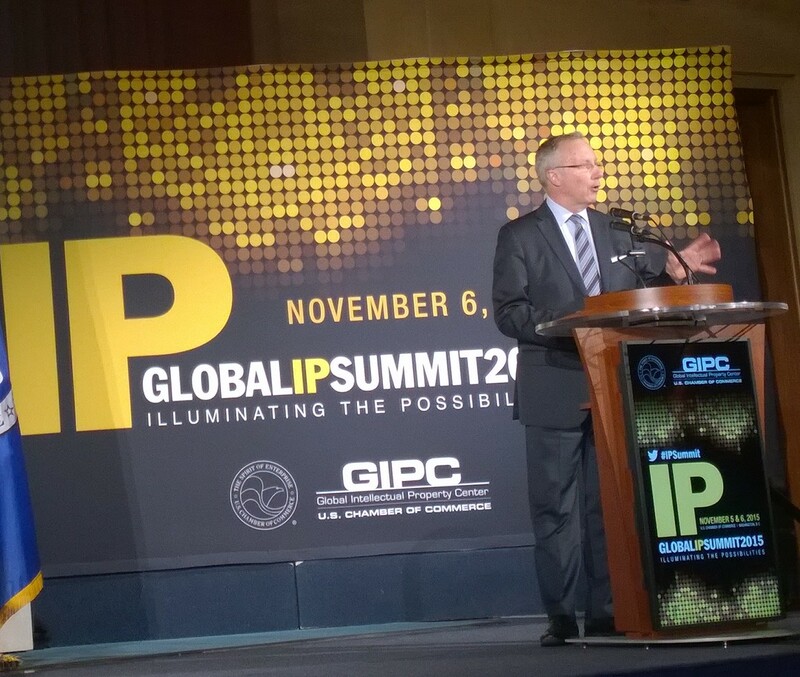 In addition to these substantive IP issues, there are significant challenges in non-IP area chapters that affect commercialization and utilization of IP, such as in market access for lawyers, restrictions on state owned enterprises, e-commerce, and investor-state dispute resolution. The focus in the TPP on treaties that support greater IP office to IP office cooperation in the TPP (e.g, PCT, Madrid), also underscores that this is a treaty that not only aims to raise substantive norms, but also aims to facilitate greater utilization of IP in the TPP region among its members to facilitate economic integration. It would be wrong of critics to characterize this agreement as solely a North-driven effort to impose its IP norms on the South. In addition to cooperative commitments, there are also provisions on genetic resources, access to medicines (aligning with the Doha Declaration), traditional knowledge and capacity building that reflect the interests of developing countries. China’s recent past has shown that China can enter into WTO plus commitments on IP. The most notable are China’s joining the WIPO Internet Treaties, and thereafter hosting and ratifying the Beijing Treaty on Audiovisual Performances. However, there are also important areas that have not been specifically addressed in recent trade-related agreements, such as trade secrets, have generally shown little norm setting progress since China first enacted its trade secret law in 1993, which had arguably been undertaken in response to US pressure in 1992. The history of the past several decades of foreign engagement with China has, however, generally shown that linkage-based diplomacy, where trade concessions may be extended or removed in exchange for / or due to violations of IP-related commitments, has likely been the most effective single factor in driving IP-related changes in China. Many of the key IP-related commitments evolved in response to normalization of US-China trade relations, as well as WTO accession. With modern China’s professed interests in becoming an innovative economy, will the TPP spur additional changes that are in China’s long term interests? What kind of challenge does the TPP set for China’s own economic plans, including the revisions to the current five year plan, the National IP Strategy and China’s efforts to become a strong IP country? 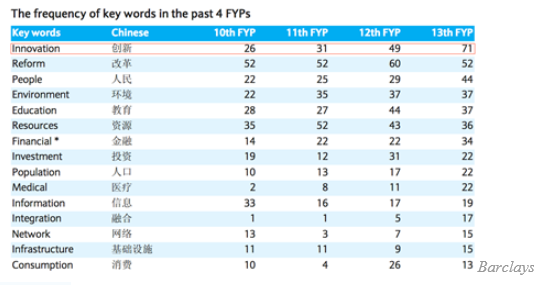 While TPP members were negotiating the final text of their agreement, China’s state planners were drafting a new five year plan, which will further underscore China’s commitment to developing an innovation-oriented economy (see chart below, prepared by Barclays on frequency of ‘innovation’ in the current five year plan). China will need to look at what it gains in TPP accession in exchange for IP commitments which China may believe it is not yet prepared for, but that in the long run will clearly benefit in the Chinese economy and enable it to become more innovative. Hopefully, Chinese reformers will seize on the TPP as a way to drive a new era of economic reform, prosperity and IP harmony. Top picture: Amb. Robert Holleyman noted at a November 8, 2015 US Chamber event discussing TPP. This entry was posted in China IPR and tagged Berne Convention, data exclusivity, Doha Declaration, Five Year Plan, Genetic Resources, Innovation, Ira Shapiro, Madrid Protocol, Paris Convention, Patent Cooperation Treaty, patent linkage, Robert Holeyman, TPP, trade secrets, Traditional Knowledge, TRIPS, US Chamber, WCT, WPPT, WTO.